Members of every academic department can understand the woes of equipment failure. But there is a big difference between malfunctioning computers and stage props that fall apart in your hand. The Albion College Theater Department has been experiencing problems like these, and it’s a testament to the abilities of the department that they are able to produce shows. Students and staff continue to put on three main productions per year and additionally workshops and self-directed originals. They have had to build their own sets and make their own props on top of the pressures of performing. The Herrick Theater features two stages. The bigger “Main Stage” and the smaller, more intimate “Black Box.” The Albion College website describes the Main Stage as, “A 180-seat proscenium theatre, with a full fly system, and state-of-the-art lighting, sound, and digital projectors.” A small, intimate environment with useful and available equipment to aid the development of stage technician skills could be every drama students’ dream. Yet, members cite the lack of functional equipment to be one of the theater’s biggest weakness and a hindrance from doing all that they could. Brandon Marino, Grand Haven sophomore, claimed that lighting issues prevent students from utilizing both theaters at the same time. Due to the fact that both theaters share the same circuitry, only one can be lit at a time. “The problem could be solved if around 20 more circuits were installed in the Black Box,” Marino said. 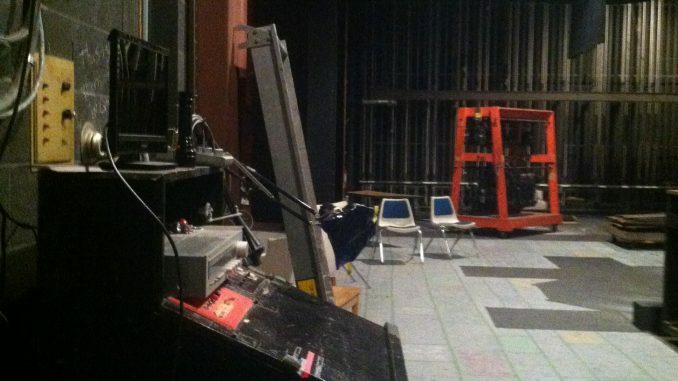 Some members of the department cited problems with props as a fault in the theater. Zach Neithercut, a Flint senior, said that the theater department lacks enough space to effectively teach classes and put on performances simultaneously. He said students need to use the equipment firsthand, as it is near impossible to learn to use the machinery without spending time in class using it. “A big thing with theater classes is that classes need to not just be in the classroom, they need to be in the different theaters. We need to be able to look and learn about what goes on in person,” Neithercut said. On top the problems in the theater and classroom, actors expressed problems with the green room, the backstage room used for meetings and a place to do homework and relax during rehearsals. However, despite the hardships of working in a crowded environment with little props to rely on, the students feel that their experiences are valuable. Despite these handicaps, the theater department manages to stage some dazzling shows and produce passionate, determined actors. They recently staged two classic plays, Hedda Gabler and The Way of The World in lavish fashion. Considering the behind the scenes struggles with making do, these shows are all the more impressive. Students claimed that the resourcefulness of the department allows them to engage in all parts of staging a show, from acting and directing to costume design and set building. “We are pretty much permitted and capable of doing anything,” Neithercut said. Theater allows for the students to learn skills outside the history and production of plays, according to Perreault. “Not only do I gain practical learning skills, critical thinking skills and problem solving skills, it gives me drive and allows me to fulfill my need to communicate to the world other people’s stories and help people learn through other’s experiences,” Perreault said. Neithercut added that the imperfections in the department better prepares students for the real world. He said that the difficulties help students develop as designers, directors, and actors. Theatre members advocate for working with the other actors to put on shows allows the students to get to know each other well, and actors also learn what it is like to work with limited resources in the real world.